Every link about the release notes of this beta has a 404 and inside the beta itself reidrect about the notes of 52.x. I think this should be fixed, sorry about that. As part of the move to Thunderbird.net we still have to work out some kinks. I’ve been using Thunderbird for many years and am happy to see it getting such attention. Keep up the good work ! Can you fix this link on what’s new for the beta: https://www.thunderbird.net/en-US/thunderbird/58.0beta/releasenotes/? You’re right, it’s broken! I’ll see what I can do! Hold up, where did you see that link at? If you see any other issues feel free to raise them there (or reply here). This is very exciting! While there are legions of mail apps, I’ve always appreciated that Thunderbird was there and worked well. To see it reinvigorated is a happy dance moment. I look forward to seeing it take advantage of the advancements of Firefox and become even more current! Hey guys, would really love it if you incorporated some of Eudora’s power-user features, e.g. alt-clicking on mailbox columns to select matching rows. Great to hear about the latest developments. Glad things are moving forward for Thunderbird. +1 glad to hear some news from Thunderbird devs and glad the projects is progressing. Thunderbird is irreplaceable for me. It's reassuring to hear that the project is going to be continued. Thank you for this great software! Glad to hear it, we’re working our butts off trying to make sure our Community knows what we are doing. Thunderbird.net should be updated soon to include many different ways to get involved. I am quite concerned by this blogpost. After having Mozilla kill many of the Addons I use on Firefox which are just impossible to do in WebExtensions, the same might happen on Thunderbird? I could live on Firefox without my beloved extensions, but the Sieve Addon, Lightning, Google Agenda and especially Correct Identity are instrumental to my daily email life. I hope that my concerns are unfounded, but the WE transition on Firefox was really a very bad experience. We absolutely understand your concerns, first and foremost I would like to say that Lightning will be fine as its lead developer is also on the Thunderbird Council. As for the other addons, I encourage you to reach out to the addon developers and let them know that you are using the addons and would like to see them update them to ensure they continue to work. I will also be reaching out the the addon devs and communicating with them about what they need to do as well. Our intention isn’t to break anyone’s experience, we’re simply trying to make sure that everything is performant and secure, which means sometimes we have to change the way that certain parts of TB work. Thank you for the update and good direction. Please be careful with this. PostgreSQL just did that, and everyone hates their newly slow application. Nobody wants to use an UI rendered in JS. …PostgreSQL moved to web technologies? What? At a glance it’s still written in C.
@HS: I think SH might be talking about changes introduced in pgAdmin 4 (vs pgAdmin 3). Thank you all very much for the renewed energy you are putting into Thunderbird. I stopped using it a while back and just recently noticed and tried out the 58 beta – it’s awsome! Thanks again. Very happy to hear Thunderbird is still pushing forward with development. I keep coming back as it just works & does what I need! Any chance we can get native CardDAV support at some point? This is the one glaring omission imo. I’m wondering if we can implement this while updating the Address book. I think this is something that we can look into as we update that component. It’s a good idea! While you are waiting for the native support. Have a look at the card book add-on. While I have never had is working correctly on Daily builds it looks like an awesome address book replacement. Cardbook is good, like Matt said, we are going to be rewriting address book to be new and shiny – so that will be awesome! I’ll definitely look into it, thanks for putting it on my radar! I’m very happy for the new hiring in Thunderbird home. I like very much TB. Really awesome to see Thunderbird is alive and a really good choice to base a new design on the theme by the Monterail team, if you had not I would have recommended it! I do have one recommendation though, and that goes not only towards you – but to the whole Mozilla team in general – and that is as simple as please use more Linux screenshots! Following blogs and reading documentation one sometimes get the feeling that Mozilla products are something Windows-only. If you could start providing screenshots from Linux, Mac, and Windows that would make it all feel more complete, something one can relate to. I’ll help along with the documentation, but the blogposts are on you. Keep on rocking and Thanks! Sure thing, I actually use Linux (rocking elementaryOS over here). I will start using screenshots from it, although the toolkit I’m using doesn’t show off the Photon look, so I had to use someone else’s screenshot. But I agree, we should ensure we have screenshots from across the spectrum! Usability in Thunderbird is only acceptable if you use the mouse heavily. Using it with keyboard only is a real pain and i’d love to see that change. Apart from that, good luck with the project! Probably the same thing keyboard users have been complaining about for as long as there has been a Thunderbird. The lack of Keyboard shortcuts. Just open the old style menu bar and look at the File menu or the tools menu. Being cross platform does not leave many shortcuts that are not used in one of the three operating systems is the reason I have heard over the years. Oh “legacy addons”: The definite guide to get rid of any external developers – now in thunderbird as well. It’s not a punishment, we simply can’t support addons that haven’t been updated for years. We’re going to be putting out as much information as we can on how addon creators can update their addons to use current API calls and the like. We’re not trying to scare of external developers, we simply want a Thunderbird that is secure and performative and that means updating things which, in turn, sometimes breaks stuff. But that’s software development. Cheers to the reinvigorated team from another longtime user. I am not sure why, but I am sure that performance of the client rapidly went down. Searching for mails, autocomplete in To fields, all went from fast to slow. Many of us complained but few had alternatives. Could you maybe look into such things? I am happy to help you with the testing. Of course, there are bug reports, but honestly, the issue is NOT solved. Maybe things are better than with v25, but nothing beats v24. I will certainly see what I can do in regards to performance. There is a lot of plumbing that we are targeting with the upcoming releases, which should help with performance across the board. As with most older projects, every once in a while technical debt needs to be paid off and we are dedicated to hiring developer(s) to pay down that technical debt and push Thunderbird forward. Thanks for pointing these bugs out, I’ll ensure the team is aware of these. TB development is still lagging behind times, still no x64 for Win, albeit Linux is enjoying it since long, and x86 OS are being phased out (we are almost in 2018 and not 2008). There are modern sleek clients outclassing TB 58 by far, e.g. eM Client (with built-in PGP/MIME and Inline PGP). Yes, Thunderbird is likely the most robust client out there in terms of scope of features and time put into it. But there are places where other applications are moving ahead of us such as design and ease-of-use. We are addressing the security issues (look for a new point release coming out very soon to address many of these in the ESR). That’s why we are revving up our development and hiring, we want to ensure Thunderbird is a first-in-class experience for years to come. Thanks for the feedback and god speed with the development! Just discovered the nightly (daily) x64 build 59 for Windows and hope that it will make into mainstream soon. Would be lovely to see the Enigmail features (PGP/MIME and Inline PGP) built-in as opposed to an external add-on. And built-in support for office365 contacts. 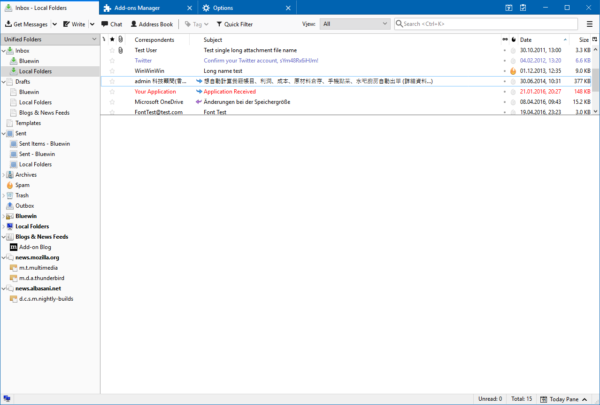 On https://addons.mozilla.org/en-US/thunderbird/extensions/ would like to see Reminderfox Addon could be moved to “Calendar and Date/Time”, it has nearly nothing to do with the current “Message and News Reading”. Also I understood the TB addons page is moved to http://www.thunderbird.net ? We are in the process of moving most of this stuff to Thunderbird.net – although the addons page has not yet been moved AFAIK. The startup page, however, has been. I use Thunderbird as my only e-mail and chat client under Ubuntu at work. It is very important to me that it can be minimized zo tray and that the tray icon instantly informs me about incoming e-mails and chat calls. Currently it is not natively supported by Thunderbird under Ubuntu, but there is an add-on FireTray https://foudfou.github.io/FireTray/ which is not developed since 2015 but is still working great. I am afraid that after Thunderbird becomes the announced updates the add-on can not be used any more. I think so because the extensions are not compatible with current firefox versions. It would mean that I can no longer be informed about incoming messages. Could you consider to integrate this functionality into Thunderbird itself? Could something more systematic and planned be done? As has been noted, the switch to WebExtensions in Firefox Quantum has gone rather badly for many of us users. I don’t see chance of a revival for Thunderbird if it alienates its current user base. Instead of just making suggestions to those of us following this blog, how about contacting every Thunderbird user and surveying them on what functionality that’s currently in addons absolutely needs to be in place after the switch to WebExtensions, in order to keep us using Thunderbird? This is a good idea Barry. I think surveying users about specific ideas and way in which we should go being positive. Thanks for the feedback! Perhaps engaging with the add-on developers more actively than it been the case for FF Q, to check who is actively developing and willing to make the transition. FF Q WE is still a painful mess and likely to continue till FF 60, considering the bugs popping up citing under/misdeveloped and none-existent APIs. One sample is Lightning Calendar 6.02b by Mozilla itself marked as incompatible with TB 59.0a1 x64 on Win 10 x64. Agreed, I’m trying to put together a strategy to engage add-on developers actively and ensure that we don’t pull the rug out from users or developers. It’s going to be a rough process no matter how you cut it but we are trying to handle it in a thoughtful way. Of course, there aren’t that many of us working for Thunderbird, and our core team consists mostly of volunteers, so hearing the community’s voices and getting their help in sharing the word and reaching out to developers is very helpful. Ryan, thank you for the response. I shall try to contact the add-on developer However, he has discontinued the project in early 2016. I shall also add a feature request. I am just afraid that it does not get more attention than by post. It would mean there was just no e-mail client working under ubuntu and offering this very important features. I have found that feature request to minimize Thunderbird to tray was submitted 15 years ago and still was not implemented. Also, all known add-ons filling the gap and currently still working with Thunderbird have been discontinued. Ryan, couldn’t you please give this issue your personal attention? It looks like we are going to lose something really important after the planned Thunderbird update. We develop and maintain an AddIn for Thunderbird (Windows+Linux) since years and it has to call a local installed software with command-line options to encrypt and decrypt messages. For this, it also has to write and read from the file-system. Now, with the new AddOn technique, it sounds like this is no longer possible. I also can not find some address or forum where I can ask my questions about this. The “Thunderbird/Add-ons Guide 57” tells about possible modifications, but they will only work until Thunderbird 59. From version 60, the old technique is removed. By this, from May 2018, our AddOn will die and we have to tell the users to migrate to MS Outlook. Where can we get help on this topic? Please, Email the maildev@lists.thunderbird.net with your questions and we’ll help you get all caught up. We’re going to roll out some more resources for add-on developers in the near future, so please let me know at ryan@thunderbird.net if there is anything else we could provide that would assist you. Thanks Ryan, I will do directly in January. As I’m not having that much time the next Months, is there a way to let you or some other TB professional develop our AddIn with WebExtensions (payed, of course)? It is not that easy (read and save email parts, recompile the whole email with new body and attachments etc). For someone like you nothing special, but for me a lot of research in the net and reading TB sourcecodes and comments. Is there some official address for such requests? Or can you provide me some contact to a good freelancer for such job? If you do not like to publish here, please answer to my email address. I think posting this to the Thunderbird developer mailing list here: Maildev@lists.thunderbird.net would likely get you a lead on a developer to take this job on. Posting it describing what you are looking to do and what you are thinking as far as payment would, in my opinion, be the best way to do it. I approved the comment so that if there are any eager developers reading they can respond to you. Thanks for all the hard work and to a good start for you Ryan! These are all very interesting news. And what about switching this blog’s theme to Frontierline? Looking forward to the versions ahead. Congratulations! Will be watching closely development of web technologies based Thunderbird 🙂 Meanwhile just installed 58 Beta, thanks! Cool! Is wonderful to see Thunderbird as a standalone product. Is the ultimate plan to use own infra for everything, or do you expect to share at least something with Firefox/Mozilla? E.g. l10n repositories? We’ll own all the infrastructure over the course of the next year likely. Thunderbird is the best email software out there. I’ve been recently working on few html email templates and using litmus for verifying that they look consistant in different email software. With Thunderbird you can get what you want but with others there is many weird things going on. Outlook is like it has not advanced since 90’s 😛 It’s unbelivable that people are still using something else than TB. This is really good news to see actual movement in the Thunderbird project. It still is the most stable mail client to date and just needs some love and attention which it looks like it is getting now. I think it needs a little bit more in the “looks” category than anything else so I am excited to see the new theme. Hopefully it brings up to today’s era of modern looking email clients. The future looks bright and I’m excited to be a part of the team! I have to admit, I’m very nervous about the changes. The changes made to Firefox weren’t good for my use case, but at least I was able to fall back on an earlier fork. I’m not aware of any for Thunderbird, though… if the Thunderbird changes affect me in a similar way, I pretty much have nowhere to go. Not saying this to be disparaging… I love Thunderbird and have been using it since the very beginning! Please, make sure to keep up with what we’re doing and continue making your voice heard! That helps ensure we don’t go the wrong direction! Like many others here, I have been relying on Thunderbird for years. But lately, I started looking for alternatives because fundamental functionalities to me (PGP, conversations/theads view, powerful search, tags support,…) are simply not good enough anymore. Using Thunderbird really feels likes using Gmail – or rather Roundcube, years ago. The sad truth is that I am sticking to Thunderbird because of the lack of free (software) alternatives. I really hope that this new breath will be an opportunity to rethink the UX/UI, like Sparrow did, years ago , before being merged into/acquired by Gmail/Google. I hate to admit it, because I am on the self-hosting/de-centralization side, but Gmail is one of the best email experience I have ever had. Even Outlook/Microsoft seems to come with interesting new features – like mentions – these days. – tags/labels are super useful when implemented like Gmail does it ; TB custom search and folders are counter-intuitive and counter-productive (because when archive them, all of a sudden, my beautiful classification is lost) ; most of my mails should not belong to a single folder (and no one should have to copy them over and over for the sake of classifying them) ; I know that there are limitations to IMAP, join forces with Fastmail (and there JMAP), Protonmail, Gandi, Mailpile, Caliopen, whoever,… and find clever solutions! Promote better standards! Be the Firefox of the mail ecosystem! Long live Thunderbird and looking forward for the new developers to join the team! Highly unlikely we will have a different bugzilla system. If you have issues with bugzilla, you should make them known at https://bugzilla.mozilla.org/enter_bug.cgi?product=bugzilla.mozilla.org&component=General – it’s the only way they will know your displeasure. Ryan, would you please have someone fix the RSS feed for comments on this article? Only your comments are showing up in the feed. I’ll see what I can do Barry, thanks for the heads-up! any chance to support exchange? im stuck with the cumbersome evolution. What parts of Exchange do you currently encounter problems with? Is there a plan to “oxidate” Thunderbird ? A step-by-step rewrite of TB components in rust similiar to project quantum in Firefox would be great to improve speed and security. Right now there has been an effort to rewrite many of the components in web technologies in order to make Thunderbird run in a bunch of different places. I think that a lot of this is shaped, however, by the type of contributions we get and the voices that we hear advocating the future Thunderbird they want to see. As such, making your voice heard on the mailing list Maildev@lists.thunderbird.net and in the #thunderbird and #maildev channels on irc.mozilla.org are important steps to shaping the future of the project. https://wiki.mozilla.org/Quantum is about more than Rust. And Thunderbird uses some of the code base of Firefox, but the architecture of Thunderbird is vastly different from Firefox – plus there is much more technical debt. To change Thunderbird’s architecture is a vast undertaking, which will be done in bits and pieces. In short, there are no immediate plans to quickly “oxidate” Thunderbird. Also you should check if you could work with the authors of https://addons.mozilla.org/de/thunderbird/addon/lookout-fix-version/ and Exquilla and similiar Addons to become compatible with MS Exchange infrastructure without external addons. This is more important than PGP in my humble opinion. Thanks for pointing out the Thunderbird Conversations add-on, giving it a whirl right now. Another follow-up on this, I managed to talk to the Lookout author and right now he is planning on keeping the add-on separate and maintaining it with each release. So if we want to implement it into Thunderbird, it will have to be spearheaded and maintained by someone else I would imagine. I would love to either see the default for multiple email recipients be to enter them on the same line or then give a configuration option that would enable this functionality. Most if not all the email clients I’ve tried use this formatting standard and that’s what most users are used to. Also, if you type in 4 or 5 email addresses and want to verify one of the first ones you have to scroll back up whereas they’re all easily accessible if they’re on the same line. Stylistically it would also decrease the size of the top of the new message box. Congrats on the new job Ryan!! Eight years, yikes! I’ll spam this in the IRC chat and maildev list and see if I can get someone with knowledge of this bug to comment and *fingers crossed* fix it, or at least detail what’s blocking these days. It is rather difficult to comprehend why such basics been ignored/neglected for years and even forced someone to develop an add-on for a bug which should have been fixed by Mozilla in the first place. Great to hear that piece of news, Ryan! Is there a meta bug for suggesting addon functionality to be included in TB core? It allows to view TNEF encoded attachments (aka winmail.dat) without a third-party program installed and provides compatibility with proprietary email clients from Redmond. So, since this is pretty basic functionality for an email client, it would be nice to be included by default. Imho, a meta bug for these cases could make TB better by default and alleviate some of the pain occuring by the deprecation of old addons. So, I talked to the add-on author, he isn’t really interested in building it into core – but another group could work to get it integrated. We’ll see where this goes, but I think with enough comments in Bugzilla in favor of making this a part of core Thunderbird, we could maybe rally some devs to work on it. Great, I would be more than willing to help out testing. Is there already a bug for that and if yes, do you have the bug number? Overall it’s great news that Thunderbird is being revitalised, and very glad to hear about the new team hired to do this. Thunderbird really is irreplaceable – there’s no other open source mail client with that feature set. One thing that really worries me though is the plan to deprecate attachments. I understand you want to improve performance, but what good is better performance when all the good features which made Tbird stand out, and which are only provided by add-ons, are now unavailable?